A walkable downtown. A connection from Main Street to Center Street. An outdoor event space complete with an amphitheater. 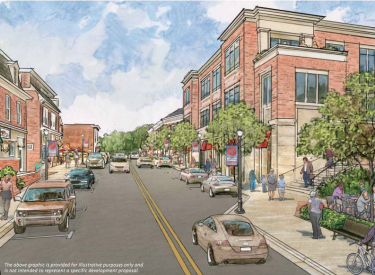 Those are all part of a vision for a future downtown Mount Airy presented Thursday night to residents, Planning Commission members, the mayor and Town Council. Design Collective, the firm hired by the town to create a vision plan, walked the audience through its ideas for improving the downtown area. One area of focus was making the downtown area more walkable, said Cecily Bedwell, who gave the presentation for Design Collective. Most people are willing to walk 10 minutes from home, so the town needs to work on making downtown more accessible. “That only works if the environment is nice and welcoming to pedestrians,” she said. Wider sidewalks and an elevator from the parking lot are among the suggestions to accomplish that. It is also about addressing gaps in businesses, Mayor Pat Rockinberg said in an interview. When people walk, they want an experience, which the town does not offer continuously on Main Street. Instead of office space, Rockinberg said it might be better to see shops and cafes with outdoor areas. Another element to increase walkability would be improving Rails to Trails. Right now, it can be uninviting, especially at night, due to lighting and lack of signage. The vision plan takes the improvements one step further by starting the Rails to Trails entrance at the Rail Yard. “Mount Airy has always been challenged by getting residents on a walkable way to Main Street,” Councilman Larry Hushour said. The Rail Yard was a focus area in the plan. Under then vision, the Rail Yard could have a lawn area with a stage as well as a patio, which would provide a space for events. “You really have a lot of opportunities here you could build on,” Bedwell said. Another area that has his attention is the connection of Center Street to Md. 27. He’s been pushing for the connection for a while, he said, adding that it is one of the only times he would advocate obtaining property through eminent domain. No one currently lives on the property, and connecting Center Street to Md. 27 will open a new entry point to the downtown area. It will also help make some of the other ideas in the vision plan feasible. Under the vision, the Beck property, the vacant property, could be turned into a mini-downtown area. It would keep the character of Main Street, Rockinberg said. While there might be more stores, it would not be a commercial area like the Twin Arch shopping plaza down the street. It could also be an area for more residences. 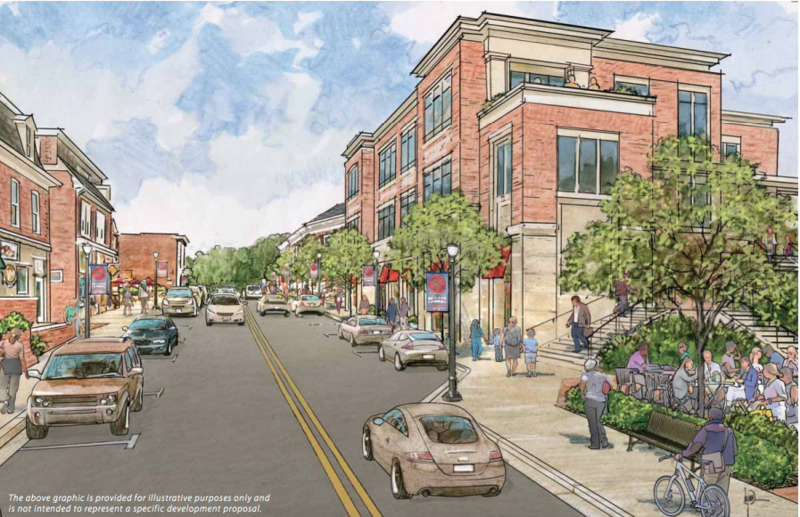 Center Street would be revamped under the vision plan, in addition to plans to connect it to Md. 27. It would see turn lanes added to make it easier for cars and firetrucks to enter and leave Main Street. This is in part due to the removal of the intersection of Park Avenue and Main Street. The vision would see the intersection turned into a plaza next to a new building where the Flat Iron Building stands now. The Flat Iron Building would come down under the vision plan. The building is vacant, and while it is a historic element of the town, there have been concerns about its safety. A new building would replace it slightly farther from the street, allowing the town to widen the sidewalks. Right now, it can be dangerous to walk by the building, Rockinberg said. The Flat Iron Building has been one area of push-back during the multiple-year process to plan ahead for downtown Mount Airy. The vision plan included short-term and long-term implementation steps, although Helt said that the town, historically, moves slowly and cautiously. The vision plan is, as it describes, a vision for the town, Rockinberg said. It could be used to help the Town Council decide whether to approve projects for the downtown area, Rockinberg said. While there are public areas, many of the elements will be done by private industry. Next the plan goes to the Planning Commission, which meets Monday. After that, it will go to the council.